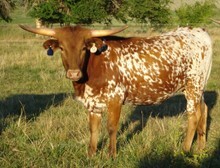 Quanah is a big 76" TTT cow sired by 75" TTT, DH Red Ranger, and out of a Phenomenon granddaughter. 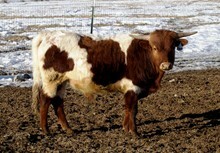 Her pedigree is full of the old, proven genetics of the breed such as Texas Ranger JP, Doherty 698, Dixie Hunter, Classic and Watson's Independance to name a few. All of her offspring will be Millennium Futurity eligible.